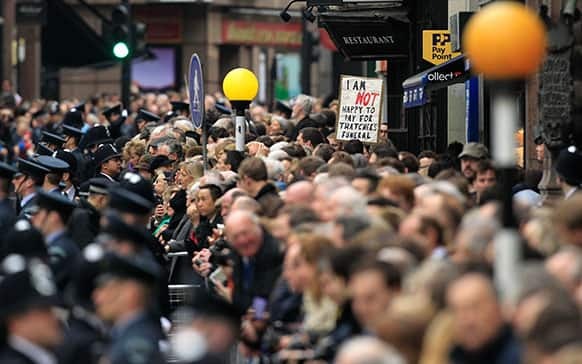 Crowds throng the route before former British Prime Minister Margaret Thatcher`s ceremonial funeral procession in London. 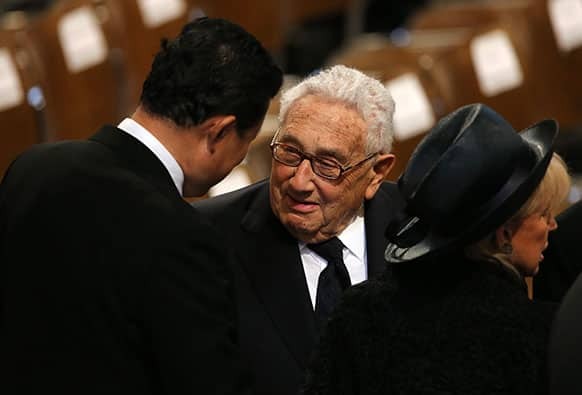 Former US Secretary of State Henry Kissinger attends the Ceremonial funeral of former British Prime Minister Margaret Thatcher at St Paul`s Cathedral in London. 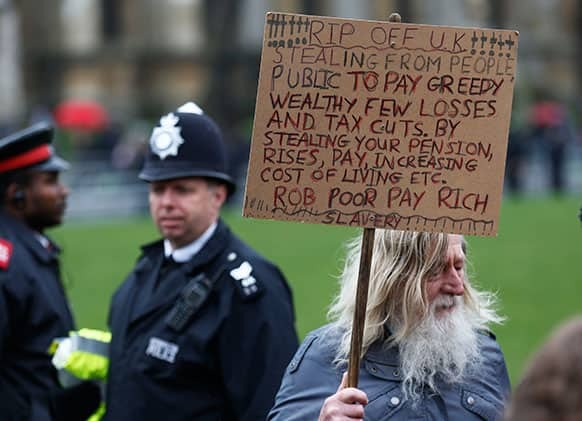 An anti-Thatcher protester holds up a banner at Parliament Square in London. 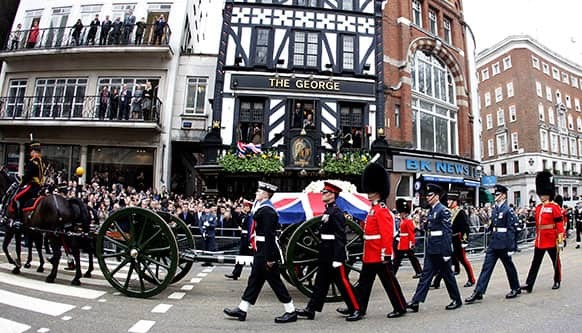 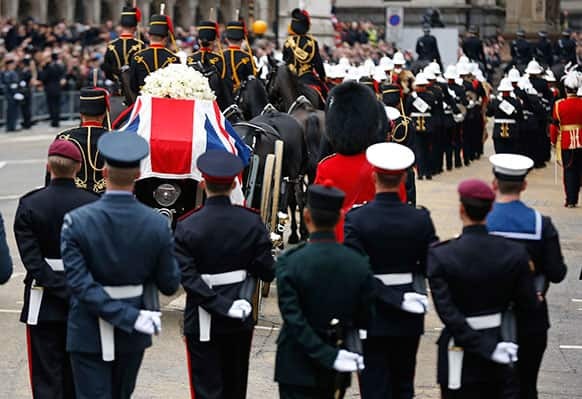 A Union flag draped coffin bearing the body of former British Prime Minister Margaret Thatcher is carried on a gun carriage drawn by the King`s Troop Royal Artillery during her ceremonial funeral procession in London. 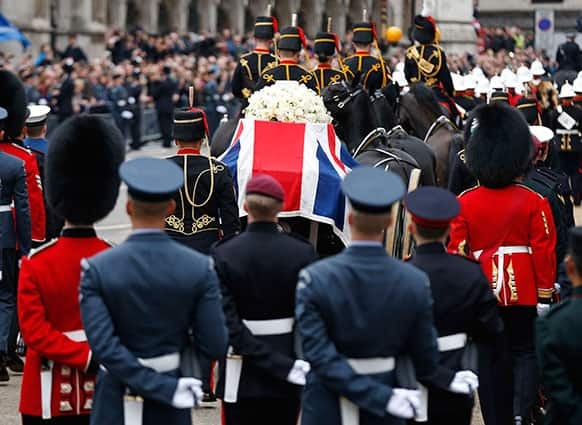 Pallbearers carry the coffin bearing the body of former British Prime Minister Margaret Thatcher as it leaves the chapel of St Mary Undercroft at the Houses of Parliament during her ceremonial funeral in central London. 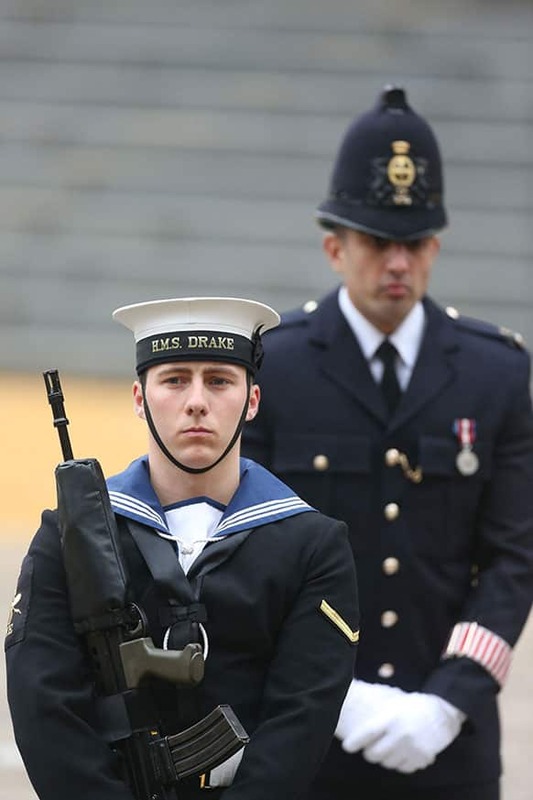 A member of the armed forces stands guard in front of a police officer during the funeral of former British Prime Minister Margaret Thatcher at St Paul`s Cathedral in London. 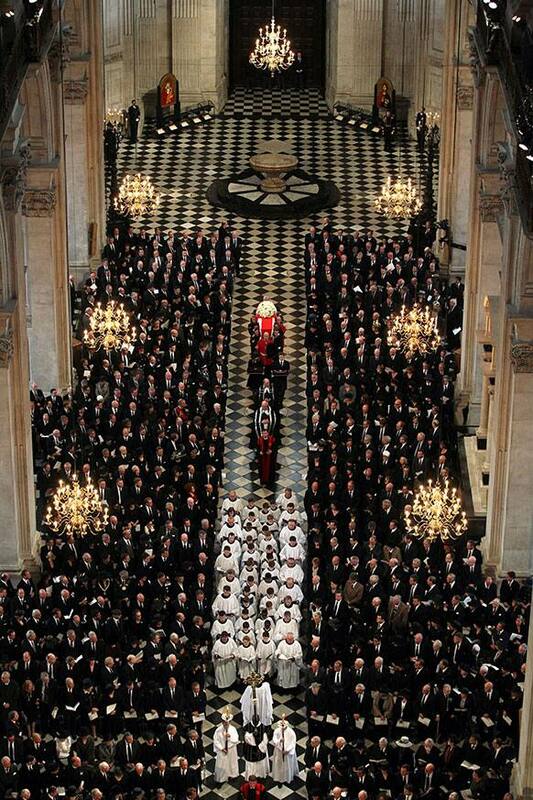 An overhead view of guests attending the ceremonial funeral of former British Prime Minister Margaret Thatcher at St Paul`s Cathedral in London. 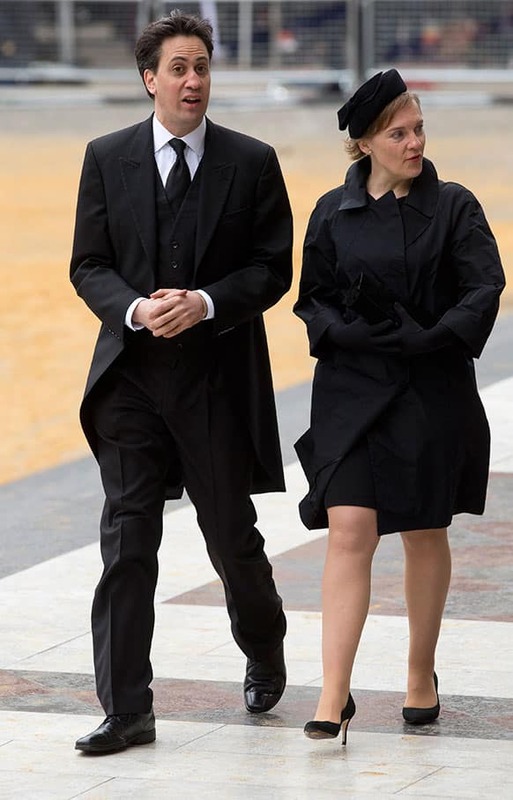 British opposition party leader Ed Milliband, left, and his wife Justine Thornton arrive for the funeral of former British Prime Minister Margaret Thatcher, outside St. Paul`s Cathedral, London. 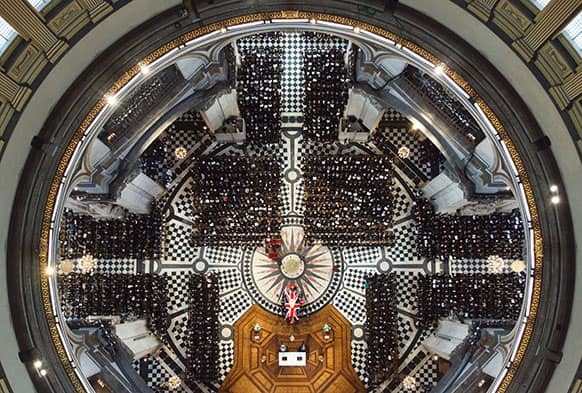 An overhead view shows the coffin containing the body of former British Prime Minister Margaret Thatcher carried down the aisle at St Paul`s Cathedral in London. 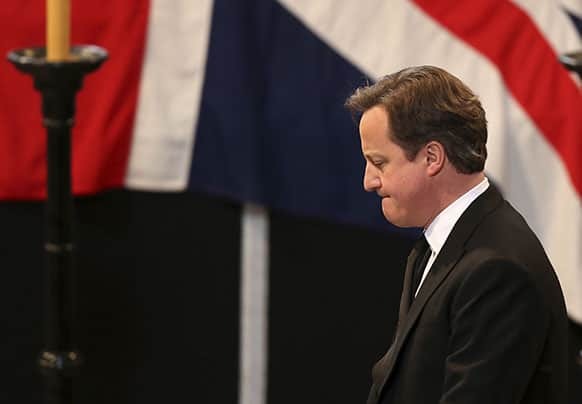 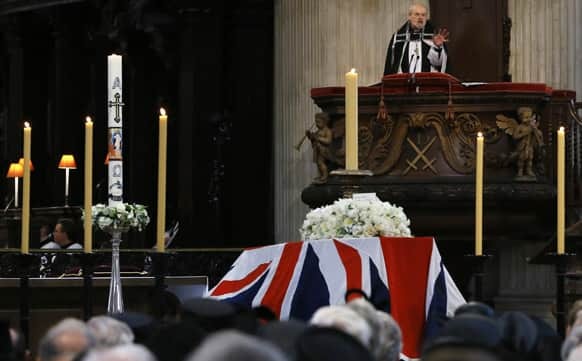 Britain`s Prime Minister David Cameron gives a reading during the ceremonial funeral of former British Prime Minister Margaret Thatcher at St Paul`s Cathedral in London. 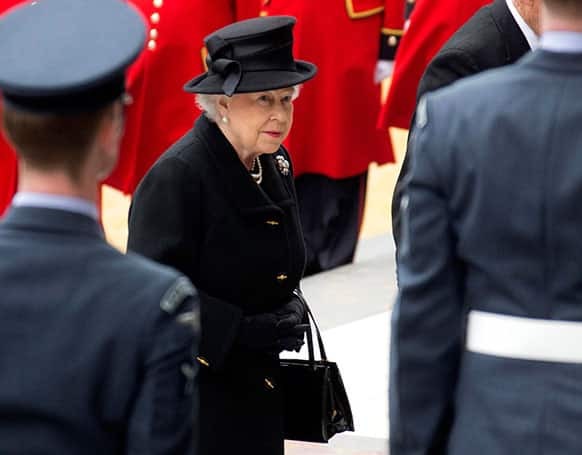 Britain`s Queen Elizabeth II arrives for the funeral of former British Prime Minister Margaret Thatcher, outside St. Paul`s Cathedral, London. 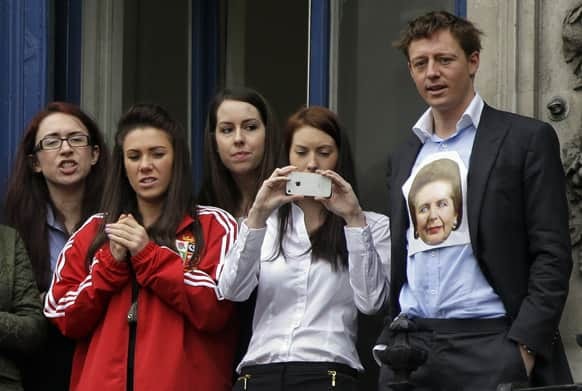 An office worker wearing a depiction of former British Prime Minister Margaret Thatcher on his shirt, and others watch the ceremonial funeral procession for the former prime minister from an office balcony in central London. 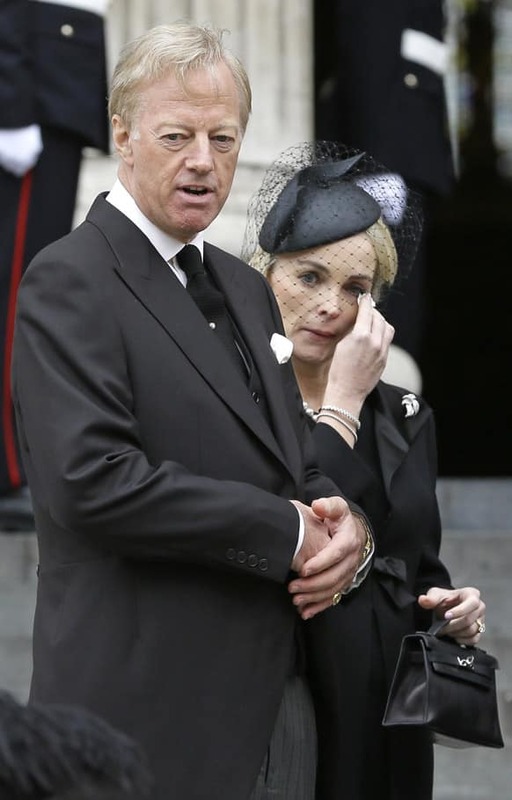 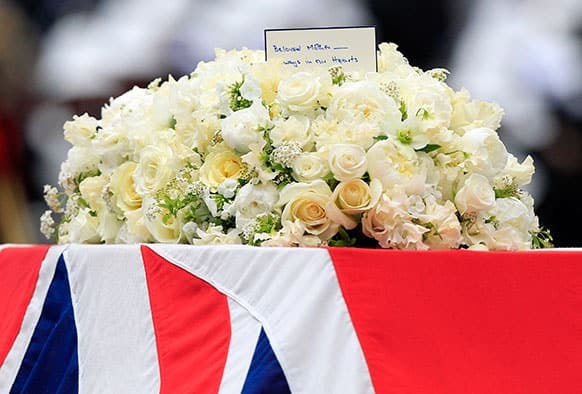 Mark Thatcher, looks on as his wife Sarah wipes her eyes after the coffin of his mother, former British Prime Minister Margaret Thatcher was carried by pallbearers out from St Paul`s Cathedral, following the ceremonial funeral service in London. 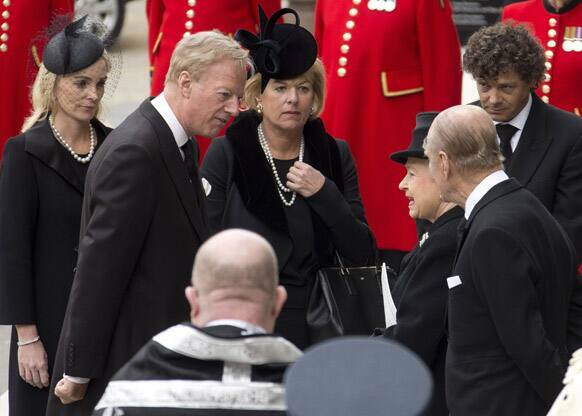 Britain`s Queen Elizabeth II, third from right, speaks with Carol Thatcher, center, and Mark Thatcher, second from left, the children of former British Prime Minister Margaret Thatcher, outside St. Paul`s Cathedral, in central London. 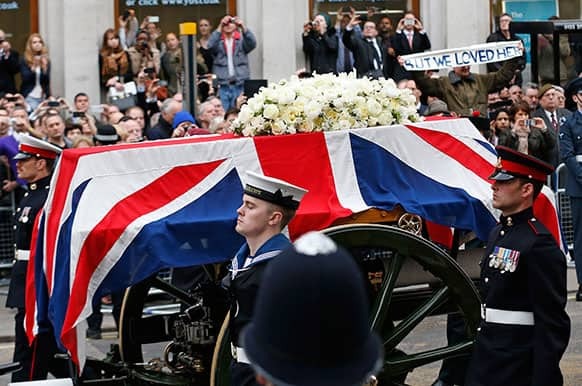 British singer Katherine Jenkins leaves the funeral of former British Prime Minister Margaret Thatcher, at St. Paul`s Cathedral, in central London. 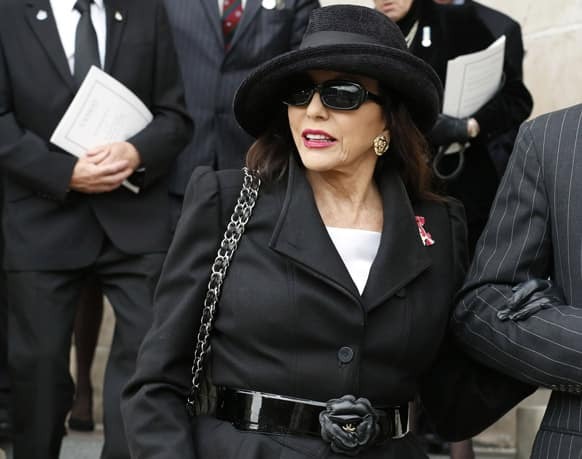 Actress Joan Collins leaves after attending the funeral service of former British Prime Minister Margaret Thatcher at St Paul`s Cathedral, in London. 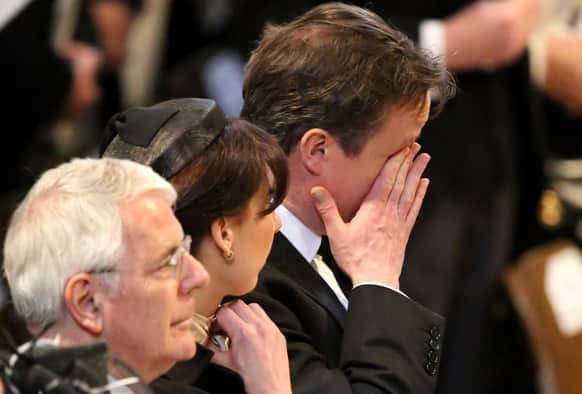 Britain`s Prime Minister David Cameron wipes his face next to his wife Samantha Cameron and former British Prime Minister John Major as they attend during the ceremonial funeral of former British Prime Minister Margaret Thatcher at St Paul`s Cathedral in London. 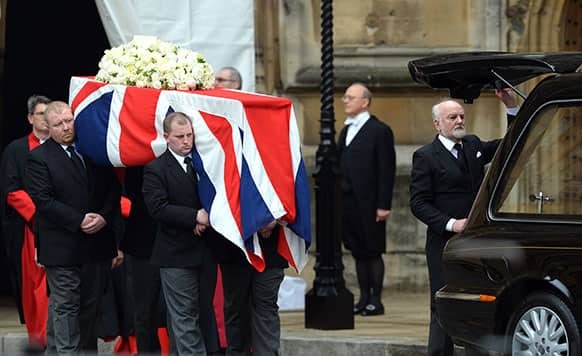 The Bishop of London Richard Chartres delivers an address near the coffin containing the body of former British Prime Minister Margaret Thatcher during her funeral service in St Paul`s Cathedral in London.